The European Space Agency (ESA) has just successfully completed a test run for its Intermediate eXperimental Vehicle (IXV) prototype. The IXV project is paving the way for a future of autonomous reentry vehicles, and the test run demonstrates IXV’s ability for safe recovery. Last week, the ESA simulated a returning spacecraft by dropping the IXV from a height of nearly 10,000 feet. It gained speed as it fell, and then deployed its parachute, which slowed it down and allowed for a safe splashdown just off the coast of Italy. Similar tests for autonomous reentry vehicles, particularly with regards to the speed and angles affecting water impact, have been previously conducted by CNR-INSEAN of Rome. Tests of supersonic parachutes similar to the one used by the IXV have been conducted in Arizona at the Yuma Proving Ground. Supersonic parachutes are aerodynamic decelerators used for atmospheric descents. While they can be packed efficiently, they maintain a low mass which maximizes their ability to decelerate even at supersonic (above the speed of sound) or subsonic (below the speed of sound) speeds. Parachutes designed to slow objects falling at supersonic speeds require complex construction, as pressurization and the imbalanced forces of gravity and the parachute’s low inertia can cause structural deformations that can compromise the integrity of the parachute. In last week’s IXV test, after the main subsonic parachute was deployed, a series of other actions followed: the parachute’s thermal protection covers were cut, and actuators released and jettisoned panels that covered the flotation balloons. Then the parachute prepared for impact with the water and activated beacons allowing it to communicate with a satellite so the craft could be located. All went according to plan except an abnormality in the balloon inflation, which will be analyzed. Researchers recovered the IXV prototype and are currently inspecting it for indications of future improvements. 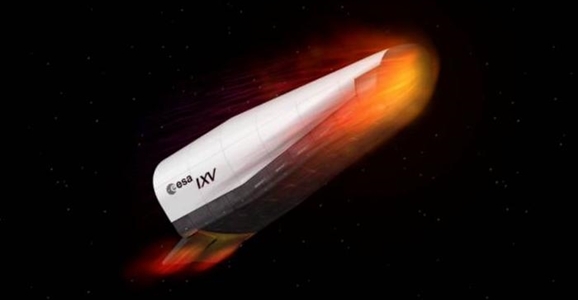 The IXV will undergo further tests on its hypersonic and supersonic systems next year, when it’s sent into a suborbital path on the Vega launcher and will then reenter’s Earth’s atmosphere, eventually making another water landing. The IXV represents another phase of the development and implementation of autonomous vehicles in space exploration. As of yet, no reports indicate the ability of such crafts to do push-ups on the Moon, however.